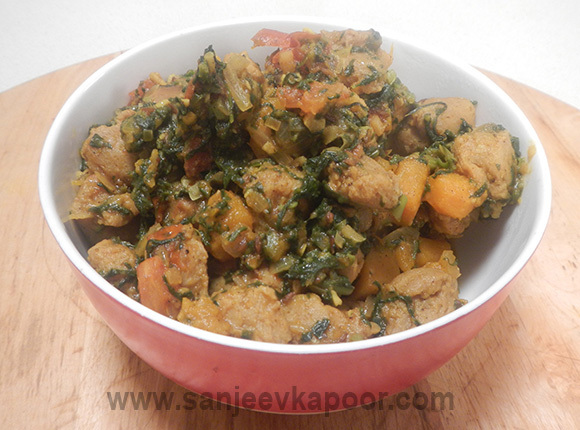 This healthy tasty soya nugget dish tastes wonderful with hot paranthe. Pressure cook soya nuggets with spinach, fenugreek leaves and pumpkin in 1 cup water till 1whistle is given out. Lower heat and cook for 3-4 minutes. Heat oil in a non-stick pan. Add cumin seeds, turmeric powder and green chillies, mix and sauté for ½ minute. Add garlic and ginger, stir and sauté till fragrant. Add onion, stir and sauté till it turns translucent. Add tomato, stir and sauté on low heat till it turns soft and pulpy. Add pressure cooked nuggets mixture and mix well. Add salt, cumin powder, garam masala powder and pepper powder, mix well and cook on low heat for 2-3 minutes.